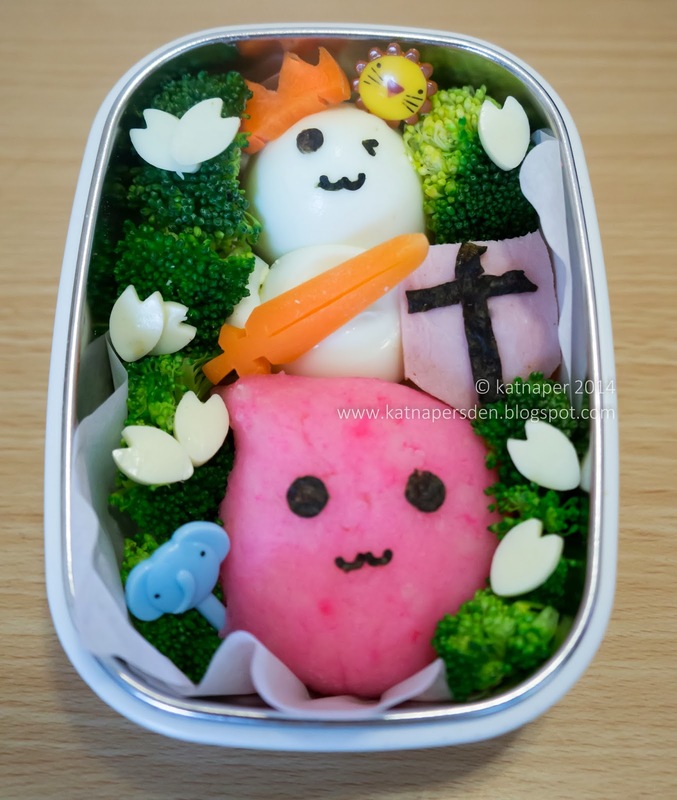 katnaper's den: Bento #16: Knight in Shiny Armor? This is the first time I ever worked with mashed potatoes and it takes a bit of getting used to, I'd have to say. Its in a way, easier and harder to shape than rice. I don't know what others experiences are with it but that's how it was for me. I found that 'squishing' it into shape is easier but it also makes it fall apart faster or get distorted faster if you're not careful. It was fun adding color to it though. Anyway, back to the theme of this bento, I thought I'd skip ahead on BBN's theme and do a medieval one. I based it loosely off this design I found on the net of a cute Dragonquest Slime Knight. My version turned out not as cute as the original but I think it was still okay. I did the knight with a hard boiled egg. The shield was made out of ham and the sword and crown from carrots. The Slime steed is made of pink mashed potatoes. The bushes are broccoli and the flowers are made of cheese. The faces and other details are from nori seaweed.